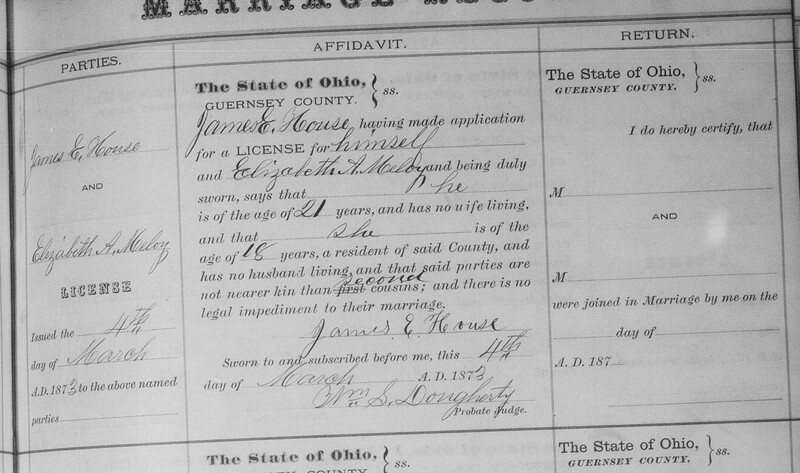 As I was going through the Ohio County Marriage Records on FamilySearch.org yesterday, I came across three listings for James E. House in Guernsey County, Ohio. Two of them are known to me. My great-grandfather, James Emory House, married Barbara Shryock on May 29, 1866. They went on to have one son, Edward F. House, and two daughters – Belle Dora House and Lucina House. Barbara (also called Barbary) died on July 10, 1872. Then the story goes that James had Frances Ogan keeping house for him – as told in a letter written by his youngest son, Alva Lester House, to my aunt Gertrude. So Father got my mother to keep house for him after his wife died. So him and Mother got married and they had 8 children. 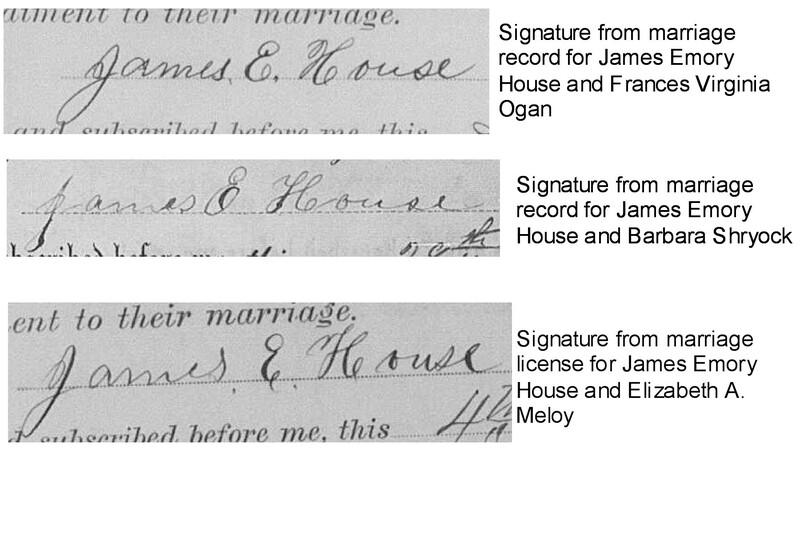 James and Frances (Ogan) were married on May 26, 1873. Their first son, Florus Allen House (named after James’ father), was born a month prior to their marriage on April 21, 1873. And this is where it gets interesting. 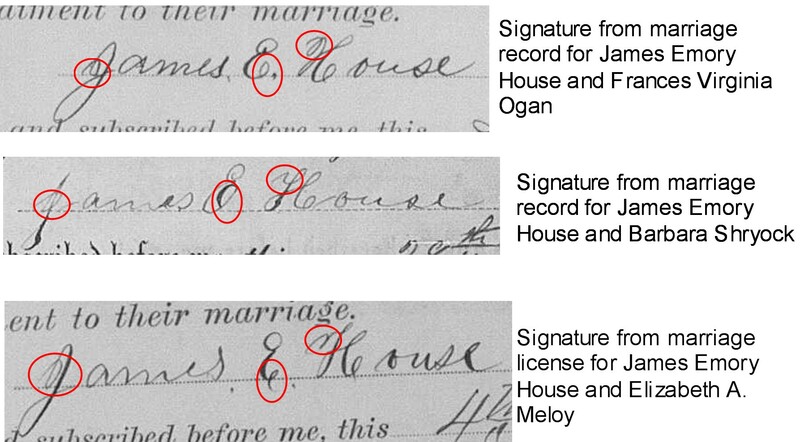 When I clicked on the third entry for James E. House on the marriage records, it showed a marriage license issued on March 4, 1873, for James E. House and Elizabeth A. Meloy- it was never returned – and the couple didn’t get married. Curious! In order to determine if this was my great-grandfather, I set about comparing signatures. I looked at all three – since two of them were “documented” as true and correct (sources are the children of my great-grandfather and his two wives – Barbara and Frances) – then I needed to compare his signatures with the one on the license for Elizabet Meloy. I set about trying to find out who this Elizabeth was. It seemed that whomever wrote down the names on the licenses, didn’t check for spelling. Either that or my great-grandfather was very bad at remembering spelling or names. Instead of Barbara Shryock – she is listed as Barbary – which is what James wrote down on his pension application. Instead of Frances or even “Frankie” – she is listed as Frank. So that made me realize that Meloy could be a convoluted spelling for Malloy or Maloy. After not finding any possible Meloy families in the census, I looked for Maloy families. James had grown up in Linton Township, Coshocton County, Ohio. In the 1860 US Census, he is living with his parents (Florus and Julia House) in Linton Township, dwelling and family number 778. Elizabeth Maloy, 9 years old, is living in the William and Louisa Maloy household in Linton Township, dwelling and family number 759. In the 1870 US Census, Elizabeth is still living with her parents. She is listed as age 18. The family had moved to Monroe Township, Muskingum County, Ohio. Since I have not been able to locate James and Barbara in the 1870 US Census, it is unknown where they were living. What I do know is James’ parents, Florus and Julia, were married in Muskingum County – so perhaps Julia’s family still lived in the area and perhaps they visited them from time to time. I would imagine that the families knew each other from some community function – church, school, or a social club. Elizabeth was about 8 years younger than James. She was three years younger than one of his sisters and two years older than another one. Further research on Elizabeth indicates that there was an Elizabeth Maloy who married James Parks on June 13, 1877 in Coshocton County, Ohio. I can only assume that this is the same woman. I’m still looking for more information. Right now Elizabeth Meloy/Maloy is just as mysterious as she was when I found the marriage license! This is an update to my post from July 24, 2008, Elusive Great-Great-Aunt Rachel, where I listed information I knew and what I had found concerning my maternal great-grandmother’s sister, Rachel Blazer. Rachel had married Maurice (or Morris – depending on the document) Given about 1897 according to the 1910 Census that lists them as married 13 years. While I was researching one of my brick wall ancestors (Franklin Blazer – Rachel’s father – who I will post about soon! ), I ran across the name “Rachel Blazer” in the Chicago Tribune for the June 20, 1897 edition. Listed under “Marriage Licenses” that were issued the day prior, were the names Maurice Given, age 38, residence listed as Madison, Kansas and Rachel Blazer, age 29, residence listed as Anderson, Madison County, Indiana. Ta-Da! This is what I consider Serendipity! I was looking for something else – albeit Rachel’s father – and discovered more informaton on Elusive Great-Great-Aunt Rachel!